Now that we’re back in the full swing of fall, long summer vacations are a thing of the past. Sure, you could take a two-week jaunt to Europe in the middle of October, but between football and school and everyone else actually being in the office, being gone for so long isn’t quite as easy. Hence the quick fall weekend escape, an opportunity for you to get out of town without throwing your whole life out of whack. It’s still a vacation, just a short one. When thinking about where to go for a weekend, obvious names like New York City, Miami, or San Francisco come to mind. But those cities are often packed with everyone else who had the same idea — plus, they’re usually pretty expensive for a weekend jaunt. Instead, try exploring some places that offer just as much excitement without the crowds and inflated prices. From rehabbed rust-belt cities to small towns in the Smoky Mountains, here are five underrated weekend cities that are worth visiting this fall. 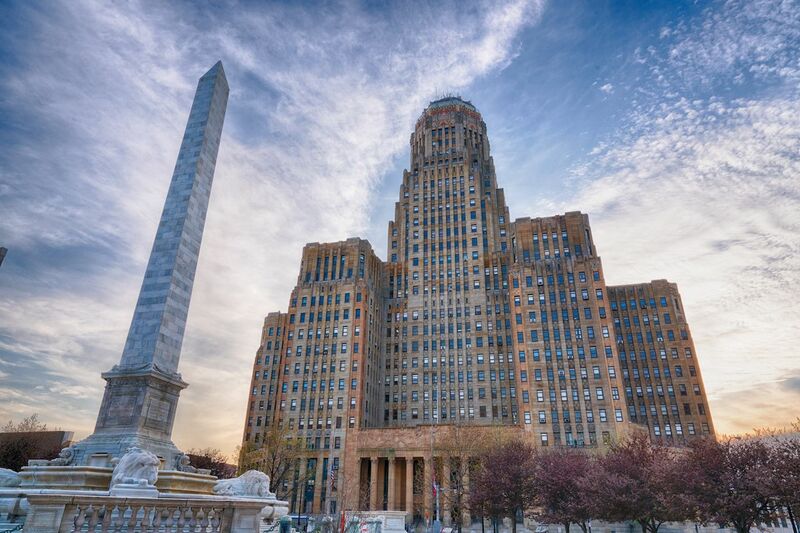 No city has taken its industrial relics and turned them into something great like Buffalo. Head to Buffalo Riverworks, where you can climb up old grain silos, zip-line between them, play some ice hockey inside, then enjoy a fresh beer by the water. Nearby, you can rent a kayak and paddle canals that run through old silos and factories in Silo City, a fascinating industrial ghost town that’s now a scenic float through the city’s history. The neighborhoods here are anchored by corner bars that are as lively and chaotic as any in larger, sexier cities. Spots like Gene McCarthy’s in the Old First Ward and Smitty’s in South Buffalo fill with locals who inhabit the surrounding craftsman houses nearly every night. And the bars here are open until 5:00 AM. That’s right, 5:00 AM. And not a night goes by in Buffalo during which you don’t make at least a couple of friends, many of whom will insist you stay out with them until closing time. This usually ends at the city’s — and possibly the state’s — grandest bad-decision bar, The Old Pink. Food here is not fancy though spots like Roost and Las Puertas are making some of the best modern American and Mexican-French food in the country. But if you’re visiting, eat what Buffalo does best: comfort food. The city launched a Wing Trail this spring where you can experience the city through its famous fried wings. Or hit up Allen Burger Venture for a fantastic burger, then Imperial Pizza for the thick-crusted glory that is a Buffalo-style pie. Mountain weekend escapes are commonplace on the West Coast, but back East, it’s harder to find towns that combine the outdoors, food, and beer. Asheville, North Carolina, gets a lot of the attention, but a little west in Chattanooga you’ll find a mountain town that feels like a big city, with some of the best outdoor adventures in America. 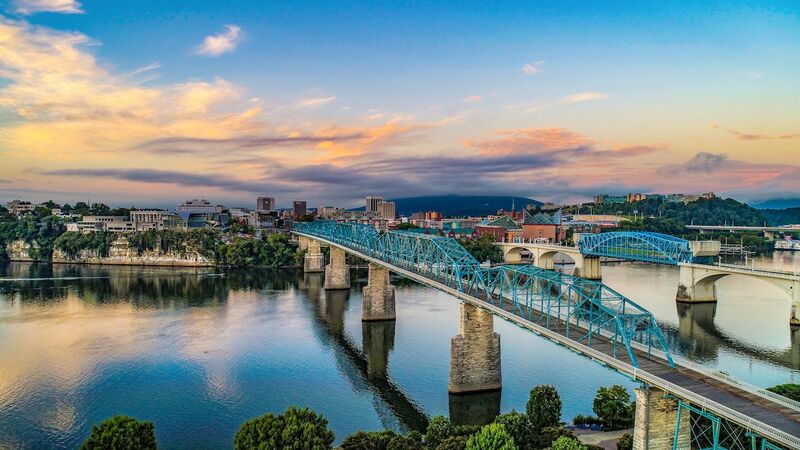 Chattanooga sits smack dab beside the Appalachian Mountains, which means it’s surrounded by challenging hikes that lead to spectacular views. Take a trek to the top of Lookout Mountain for a rewarding panorama of the city. You can also take a couple hours and explore some of the urban hikes in the 92 acres of trails at Stringer’s Ridge, which has views over the Tennessee River and city skyline. Within half an hour, you can raft Class III-IV rapids along the Ocoee river or go hang gliding over the top of Lookout Mountain. The city feels bigger than it is, with a thriving nightlife scene centered on the historic train station, now re-christened the Chattanooga Choo Choo. Here you’ll find a craft-beer bar set in an old rail car, a comedy club, a live music venue built in the old baggage claim, and the Songbirds guitar museum — home to some of the rarest guitars in the world. The owners will even let you play them if you ask nicely. Across the street is the Chattanooga Whiskey distillery, the first to open in over a century. Chattanooga’s also filled with more breweries than you’d expect in a city of under 200,000, including OddStory, Hutton & Smith, and Terminal BrewHouse. And be sure to hit Clumpies ice cream parlor, an old-school-style creamery that may just have the best ice cream in the state. When people think of the San Francisco Bay Area, San Jose is often a distant third-fiddle to cultural San Francisco and hipster-gritty Oakland. Fair enough, the capital of Silicon Valley has never had much of an identity other than as a tech hub. But a weekend here has all the stuff people come to Northern California to experience — great food, fantastic wine, and fascinating museums — with a fraction of the people. The wine country around San Jose produces stuff as good — if not better — than what you’ll find up in Napa, highlighted by the Ridge Vineyards, whose Monte Bello famously beat out prestigious French wines at the Judgment of Paris in 1976 and again during the 40th anniversary tasting two years ago. A trip into the hills of Cupertino takes you to Ridge’s hilltop estate where you’ll taste fine wines with views over Silicon Valley and the spaceship-like Apple headquarters. Once you’ve tasted the expensive stuff, head down into Los Gatos and Testarossa, where the wines are just as tasty and include a sunny courtyard for leisurely sipping. While the outdoors is beautiful, you’d be remiss if you skipped trips to Google and the glass-walled Apple Park Visitors’ Center. Going there solo might be a bit underwhelming since they don’t offer tours. 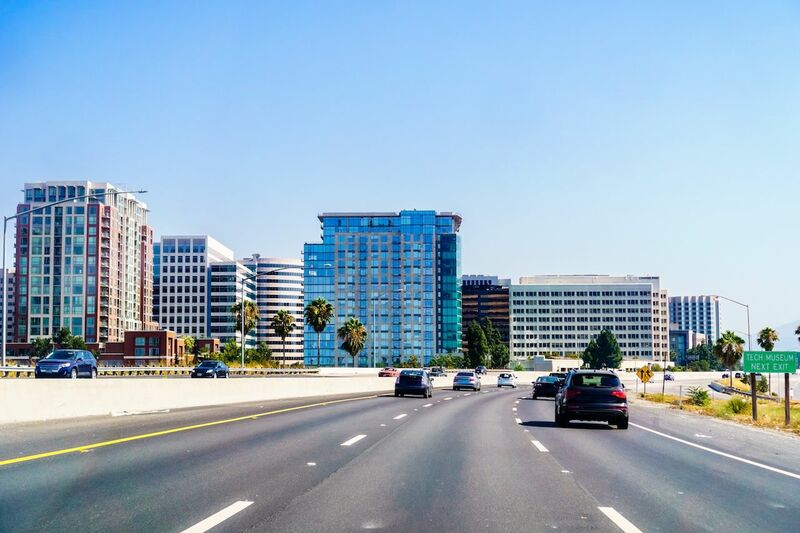 Your best bet is taking a tech tour with Traeger Tours, which will explain the history of Silicon Valley and how all the world’s innovators ended up in San Jose. The Computer History Museum is also far more interesting than you’d expect, showing how we went from computers filling entire rooms to tablets in half a century. Then, of course, there’s the food. While San Jose might not have the density of options you’ll find in San Francisco, the quality is the same. The city was a hub for Italian immigrants in the last century, and spots like Palermo and Original Joe’s have that classic Italian-American stuff that fills you up for a big weekend. Want Mission-style burritos? La Victoria is a late-night staple, which, depending on how many drinks you had at Britannia Arms, has the best burrito you’ve ever tasted. For foodies, Adega is a must-eat as the city’s Michelin-starred Portuguese restaurant offers a tasting menu for as little as $79 and up to seven courses for $120. That’s a downright bargain by Michelin-star standards. That isn’t to say that San Jose is a cheap weekend, necessarily. But compared to its neighbors, the value is tough to beat. Most people only think about West Palm when they see shots of the president enjoying his weekends at Mar-a-Lago. 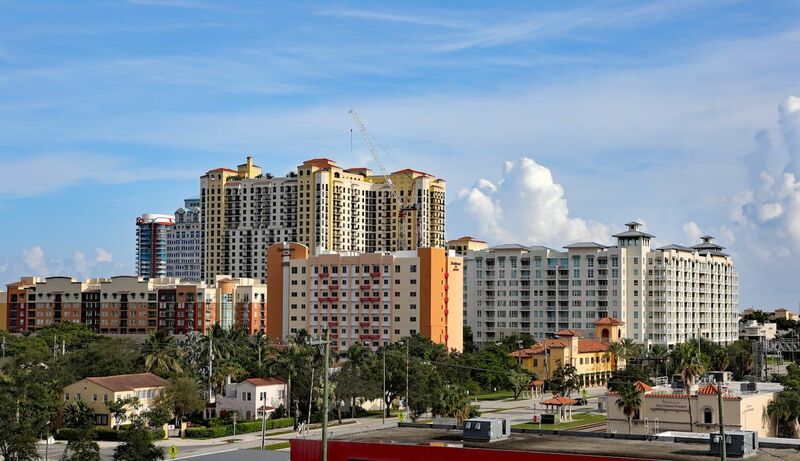 But South Florida’s third city is a surprisingly walkable, scenic, and relaxing place to spend a winter weekend. Unless, of course, you get caught in motorcade traffic. To get the lay of the land, begin your weekend with lunch or dinner at Restoration Hardware. This may sound like the type of suggestion you’d get in a city with nothing to do, but one step through the couch-filled garden and you’ll understand how it feels more like a luxury hotel than a furniture store. The rooftop restaurant has stunning views over downtown and out onto the water, a perfect place to plan out your weekend. The CityPlace outdoor mall has evolved into something more than shopping. Its former anchor, Macy’s has transformed into Culture Lab, where trippy art installations stand among deserted check-out counters and women’s sportswear display racks. Around the corner from there, grab a drink at the Blind Monk, a craft-beer and fine-wine bar that serves inventive tapas. Or hit the West Palm Brewery and Wine Vault if you prefer your craft drinks with giant soft pretzels. Drinking by the water at the venerable E. R. Bradley’s is a must, but after that, jump on a public bike and take a short ride across the Intracoastal to Palm Beach Island. Here you can cruise past the swanky shops of Worth Avenue, then dine at Café Boulud or Buccan and pretend to fit in with the old money. If you’d rather save money, head to the side of Buccan to its sandwich counter and get the same quality food for about $12 a sandwich. Then park your bike and head to the sand for one of the more underrated beaches in southeast Florida. It’s not as wide as you might find in Miami, but the sand is soft, the water is turquoise, and most days you won’t have to share it with anyone. The popular narrative about Cleveland says that LeBron brought the city its long-awaited sports championship, and it magically turned from a downtrodden rust-belt wasteland into a happy, exciting city. And, yes, winning a title did brighten spirits here. But the truth is that this city was well on its way to becoming a fantastic weekend destination long before than magical night in Oakland. 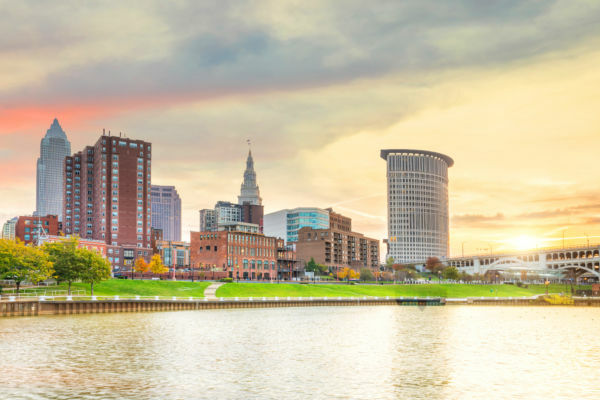 What was once called “The Mistake on the Lake” is a mistake no more, with a scenic waterfront that’s home to both the Rock & Roll Hall of Fame and a pretty respectable beach at Edgewater Park. Get there on a summer Thursday and you’ll see most of the city out for the weekly free concerts on the sand. A short walk from there brings you to Ohio City, a once-dilapidated area filled with grand homes that young residents have rehabbed to their former glory. They flock to bars like The Harp, giving the area a lively, dare we say upbeat feel. Cleveland also has more culture than people know, a leftover from the Vanderbilt money of the 19th century. The Cleveland Orchestra is generally considered one of the best in the nation, and the stately, sprawling Cleveland Museum of Art is free for all to attend. At night, you can catch a show in Playhouse Square, the largest performing-arts center outside New York City and home to countless Broadway shows and local theater performances. But the thing that put Cleveland back on the national tourism radar is its food, anchored by celebrity chefs Michael Symon and Jonathon Sawyer. You can sample them both along the closed-off path of East 4th Street, a pedestrian mall where Sawyer’s Greenhouse Tavern and Symon’s Lola Bistro and Mabel’s BBQ dominate the landscape. The city has other culinary gems, too, from Brewnuts in Gordon Square where they make donuts out of beer to Banter Beer and Wine on Detroit Ave. where you’ll find the best poutine outside Canada.